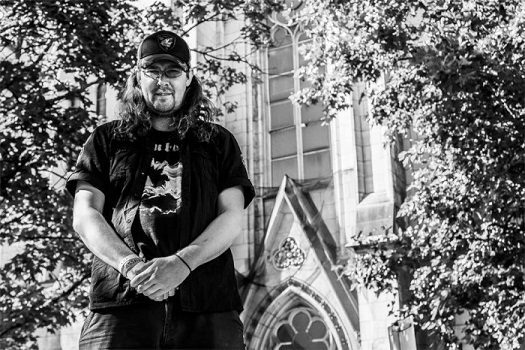 By the end of 2016, James Fogarty had gone from being an experimental metal outlier to in-demand avant-garde revivalist. Now fronting pace-setting Norwegian adventurists In the Woods…, Fogarty’s towering clean vocals were put on display, tasked with providing a voice to a band who hadn’t released new material in 17 years. As it turns out, the Brit was more than up to the task, with reviews of ITW’s Pure being universally positive. The subsequent success of ITW’s comeback has cast a light on Fogarty’s Ewigkeit project, an outlet he’s had going since 1994. Primarily brought into view during the mid-00s thanks to a deal with Earache, Ewigkeit’s astral brand of black metal was uncanny as it was demanding. Earache would subsequently let the band go after 2005’s Conspiritus, with Fogarty putting the band on ice two years later. Dead Rhetoric: Can you speak to the impact your involvement with In the Woods… has had on your career? What has changed and what hasn’t changed? James Fogarty: I think that helping to resurrect one of my favourite bands from the Norwegian metal scene has been both a joy and a great accomplishment. I don’t think it’s a secret that my involvement was pretty crucial, and it’s nice to be able to get my work heard by an audience who otherwise probably wouldn’t be aware of me. I have worked on such a variety of stuff over the last 15 years, both commercial and non-commercial, but I haven’t (until ITW) become a member of one of my favourite bands – so that has been really cool. Dead Rhetoric: You are a man of many projects and bands at the moment. Is time at a premium, or, are you good at juggling each of them? Dead Rhetoric: A lot of people became familiar with Ewigkeit when you were on Earache in the mid-00s. What do you remember most about that point in time? Fogarty: Surprisingly, it was the album Radio Ixtlan that attracted the attention of Digby Pearson (Earache boss). It was about two weeks away from being pressed up by a small label in Eastern Europe when he emailed me about it. The reason the sound is so damn poor is because I mixed it myself and was still finding my feet with production (a never-ending lesson, believe me) However, the album that simultaneously focused my ability and shattered my hopes as an artist was Conspiritus. Digby asked for something that had commercial appeal, and I broke my balls putting together that album. The result was that, although Earache were delivered a standout release which was light years ahead of most of their artists at the time, the staffers there didn’t like it and it was doomed to fail through their lack of enthusiasm for the record. It took me a good few years to get back on the horse after that utterly disappointing experience. Dead Rhetoric: Do you think the band was a good fit for Earache? Fogarty: No. And I think that as a business, although they have put time and effort into some of their newer ’70s rock revival bands, the strength of Earache is the death metal of the early ’90s. Had they stuck to that without the forays into industrial in the late ’90s, they’d be as big as Nuclear Blast. That said, what is important? Working on what genuinely interests you (like Digby of Earache) or becoming a factory production-line of unoriginal commercial Euro-metal (Nuclear Blast)? Dead Rhetoric: Can you describe the headspace you were in when you decided to put the band on ice in 2007? 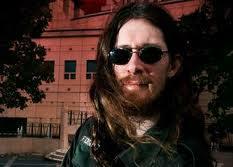 Fogarty: Utter disappointment with Earache records and a renewed sense of forging ahead. So rather than to continue pushing the Ewigkeit sound too far from its roots (which are the black metal scene of the ’90s), I decided instead to release the new material under a new name “The Bombs Of Enduring Freedom.” The debut album of that project is the logical follow-up to Conspiritus, becoming overtly critical of the real world. Once I had satisfied the need to break from the shackles of being tied to metal, I pushed it further with subsequent releases – so much so that I haven’t recorded any guitars for The Bombs… for about eight years now; it’s all either samples of my own back-catalogue of various bands, or blatant samples of stuff I love (Bolt Thrower for example) over the top of apocalytpticly heavy electronic music. Dead Rhetoric: Cosmic Man is simply fantastic. It sounds like Ewigkeit, but feels like a colossal step forward. Was it important to you to forge a new path with this one? Fogarty: The big element with this album was falling in love again with the guitar and the possibilities of what I can personally do with this instrument as a composer. I’m not trying to break any barriers with my playing – I’m not a great technical guitarist – but on a personal level, it has been a rediscovery of “the riff.” I became really jaded with the instrument, resigned to the fact that I couldn’t embrace guitars any more as every possible ‘riff’ had been done a million times before by a million people. Now, I don’t think that is incorrect statement, but I gradually realized that I just simply don’t care what other people have done on the guitar and what riffs have been written – all I care about is what I can personally write on it. 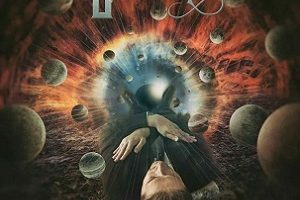 Dead Rhetoric: There is an understated NWOBHM vibe to some of your riffs. Am I off by stating that? Fogarty: No – that’s exactly right, although it would be a stretch to say I listen to much NWOBHM other than being a massive fan of Maiden. I think the riffs are equally as inspired by ’70s rock and extreme metal, but with the added twin-guitar harmonies which is so prevalent in Maiden’s material (largely inspired by ’70s rock). It’s a ‘sound’ that I fell in love with as a fan again. Dead Rhetoric: The combination of your clean vocals and keyboard work truly propels the album. To you, what’s paramount when recording: Making sure your vocals stand out, or ensuring the instrumentation is top-notch? Fogarty: This is the first Ewigkeit album where the keys have truly been a secondary consideration. I used to write half the riffs on the keys previously, but I think in order for Cosmic Man to have that element of classic rock/metal that I wanted, I needed to reign in the keys. As a result I largely limited their use to mainly Hammond Organ. However, that also gave me an opportunity to introduce some elements which I love about The Doors or Deep Purple. I think the vocals are a continuation of the style I was perusing with the new In The Woods… album Pure, but perhaps a larger dose of a ’70s rock style. I’m pretty happy with the vocals on Cosmic Man – they are completed unprocessed, and still mostly stand up against anything else I have done with clean vocals. Fogarty: A few reasons; firstly I remember as a young kid thinking that I would never be a good enough musician to play an Iron Maiden song on the guitar. So it was a challenge to myself to be able to play it (although, admittedly, the guitar solo is on keys…). Secondly, it is a nod to Maiden who I have really got into again since abandoning them for extreme metal in the early 90’s. They really are the greatest metal band on every level that musicians should look up to (whether it be their output, professionalism, business strategy). Thirdly, it’s just a great track that I love to sing along to when I’ve had too many beers. Dead Rhetoric: With everything you have going on, will it take another four years for a new album? Fogarty: We are just about to start work on writing the new In The Woods… album, but I already have an EP’s worth of new Ewigkeit tracks done! Given an uninterrupted spell of maybe six months, I will be ready with a new Ewigkeit album, but given the work necessary for ITW, it will be perhaps a year from now until I am nearing the finalizing of the next Ewigkeit album. So perhaps a realistic time frame would be late 2018 or 2019. That said, I can tell you that – purely for my own self-indulgence – I have completely rerecorded the 1997 debut album Battle Furies and am looking to have that as a free download for anybody who’d care to hear it before the end of 2017. It’s still definitely a black metal album – but I just can’t bear to hear the original version. So this is a complete re-recording of the entire thing ! Dead Rhetoric: Finally, what do you have on your agenda for the rest of 2017?